It all starts here. Out in the woods or the “Sugar bush”. Our sugar bush includes over 300 acres of Hard Maple, Red Oak, Hemlock and many other species of trees that make this sugar bush a well diversified and healthy wood lot. Maple Syrup starts as sap harvested from both Hard and Soft Maple tree varieties. Each spring we drill or “tap” a new hole in each tree that is fitted with a spile to direct the sap into our pipe line gathering system. The sap is never exposed to the elements or outside contaminants. It is collected several times daily and taken to the processing plant. We take pride in managing our sugar bush to promote healthy trees and to protect wildlife habitat and the environment. Once at our plant the collected sap is filtered and then cooked in an evaporator. We use a wood fired evaporator using waste wood from the sugarbush to make this an eco-friendly and sustainable operation. On average it will take 40 gallons of tree sap to produce one delicious gallon of Maple syrup. Mother Nature is in charge of how much sap our trees will produce. The best sap runs occur when the overnight temperature drops below freezing and increases to 45 degrees during the day with sunny calm skies. Producing the best tasting and highest quality Maple syrup is our mission. But not all Maple Syrup sold in stores and online is the same. How the sugar bush is managed, the quality of the sap collection system, when and how late in the season the sap is harvested all play a part in providing the highest quality tree sap for processing. 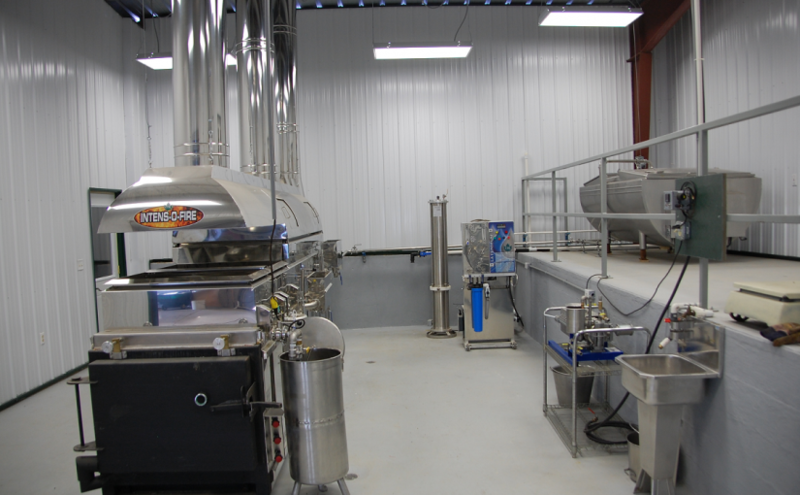 At our facility we closely monitor all our cooking and filtration systems to enhance the flavor of our Maple Syrup. The people in charge of making this delicious product are our “Sugar Makers”. Their passion is to provide you the finest Maple products available anywhere.